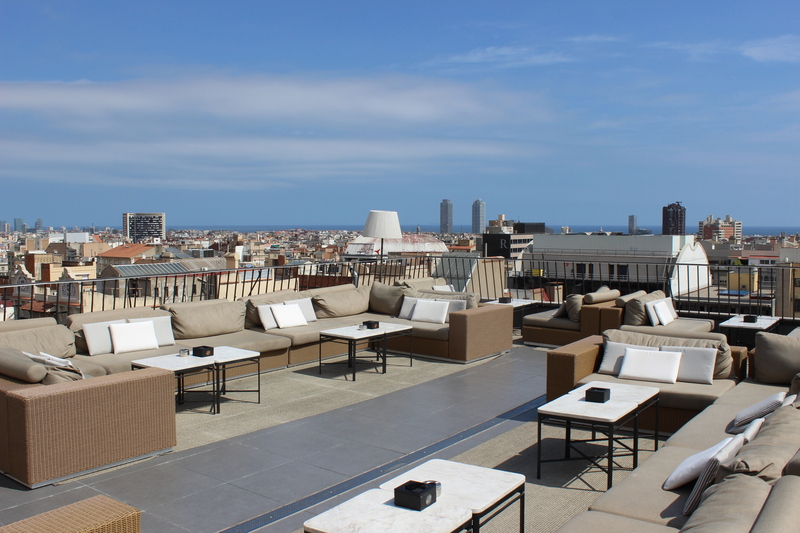 Many of Barcelona's rooftops offer a rather restricted view of the city's major sights. 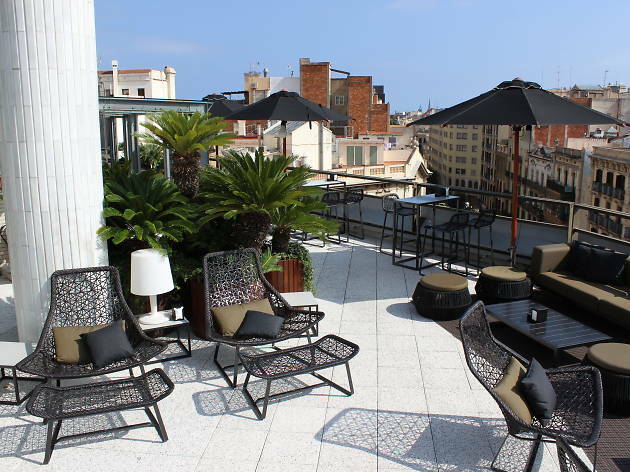 The terrace at the top of the Grand Hotel Central is a sure way to avoid disappointment: with its seemingly endless pool (for guests only) and impressive views of almost the whole city, it's no surprise that this terrace doesn't stay empty for long. The limited public access (from 8pm and with a cover charge) adds to the popularity of the venue. 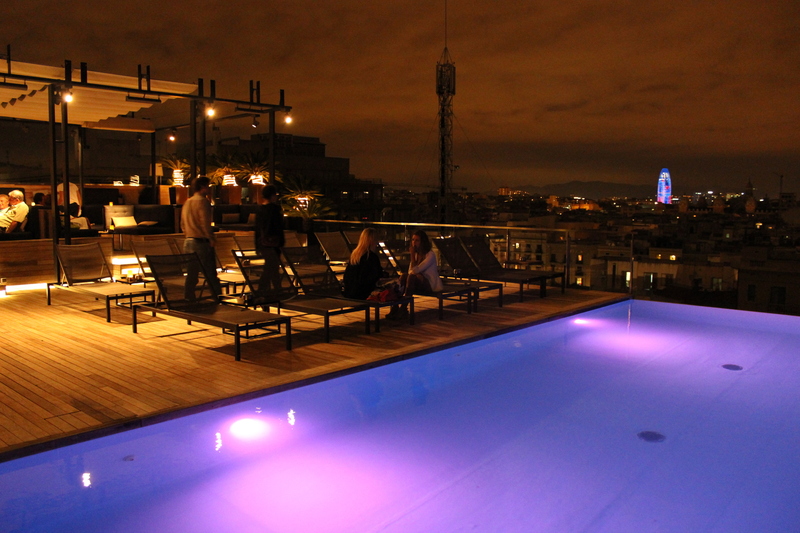 They do take reservations, and it's well worth booking ahead especially as prices here are relatively cheap... in rooftop terms. If you book in advance for dinner, you don't have to pay a cover charge. 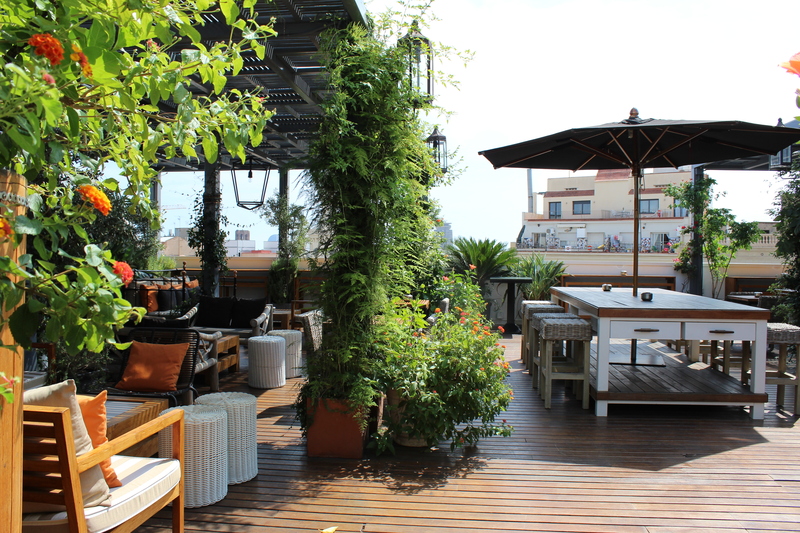 Only a stone's throw away from Barcelona's busiest square, Plaça Catalunya, this urban garden is the perfect place to kick back and relax on a temperature-friendly night. Sip a sweet cocktail while enjoying the tropical paradise around you, and as if that wasn't enough, during The Pulitzer's famous acoustic concerts (Wed-Fri, 7pm-10pm), melodic guitar sounds will round off your visit for no extra charge. 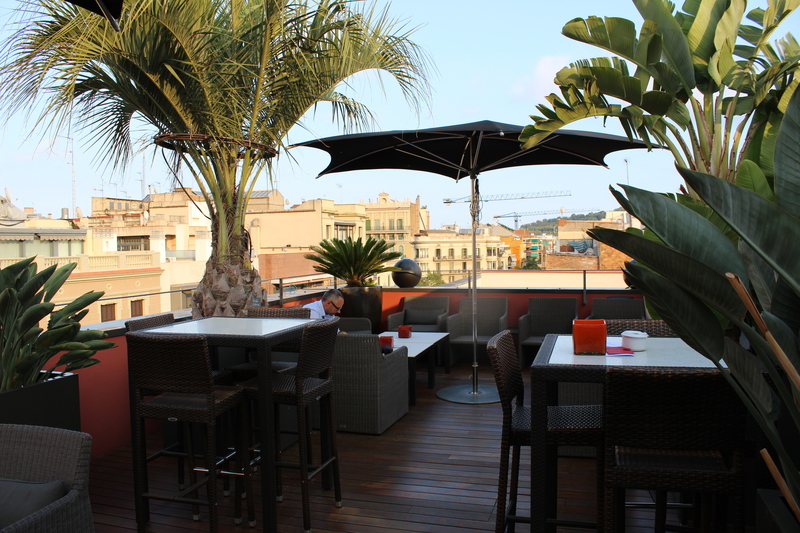 Whereas the view from this terrace may not be outstanding, the kitchen's crunchy chicken definitely is, so make sure you don't miss out on the culinary delights of the Catalan and Spanish cuisine while delighting in this green oasis in the centre of Barcelona. 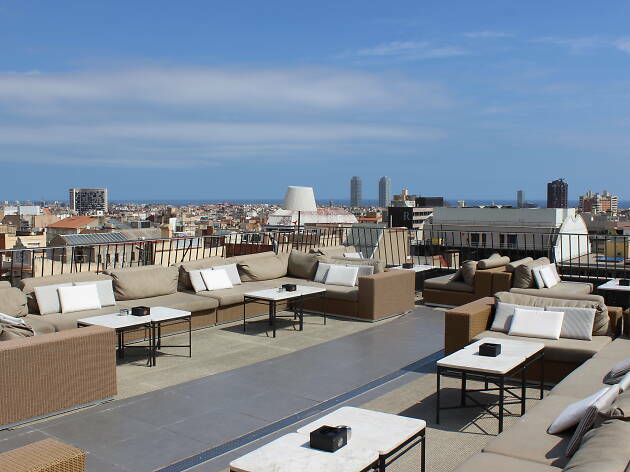 Thanks to the breathtaking 360-degree view over Barcelona and its location directly on La Rambla, there can be no doubt that La Isabela, the stylish terrace on the roof of Hotel 1898, is one of the best choices for a relaxed evening out, be it for dinner or just a few drinks. 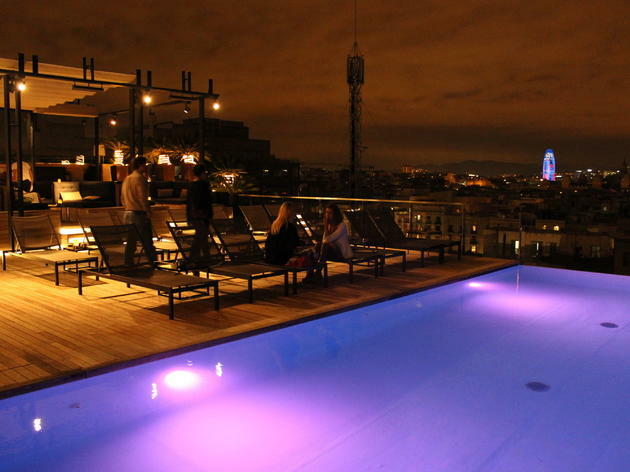 You might find this urban gem to be a bit on the pricey side, but the comfy yet elegant chill-out area, the great tapas, an outdoor pool and the fantastic view of the sunset will make the ache in your wallet worth it. You don't have to book in advance, but because La Isabela is so popular among locals and tourists alike, we recommend you make a reservation, especially if you plan to visit at the weekend. If what you're after is a hidden jewel, a place not yet over-explored by heaps of tourists, Villa Emilia's La Terraza could be the perfect place for you. 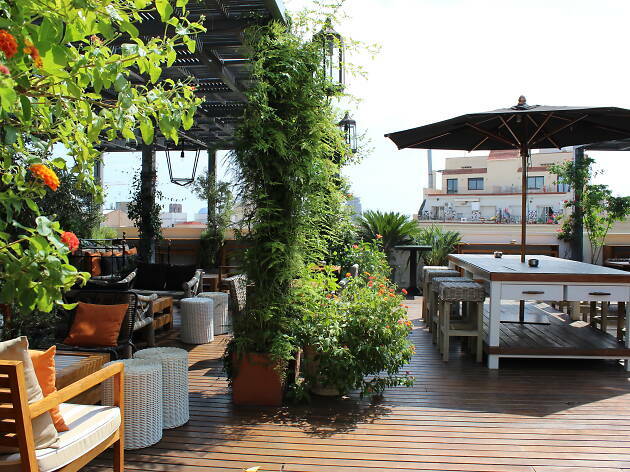 Just a short walk from Plaça Espanya, this cosy and tastefully furnished rooftop terrace is a prime example of Barcelona's Mediterranean and laid-back side. 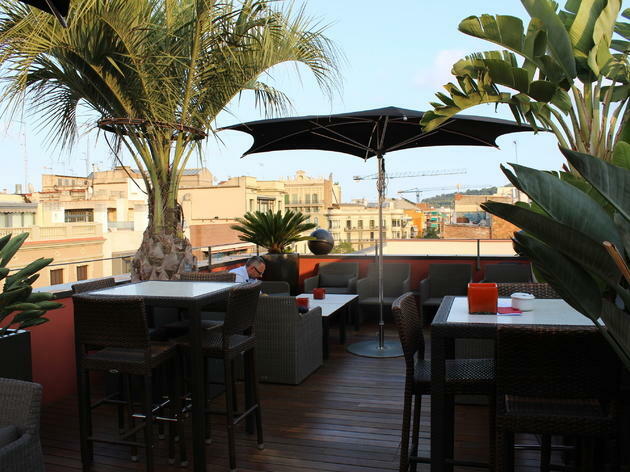 The view from La Terraza is not as magnificient as from other rooftops, but the place itself makes up for it with its intimate atmosphere, and prides itself on its live music sessions on Thursdays and Saturdays (7.30pm-9.30pm), when they also put on their popular barbecue nights (8pm-11pm; pre-booking for these events is essential). 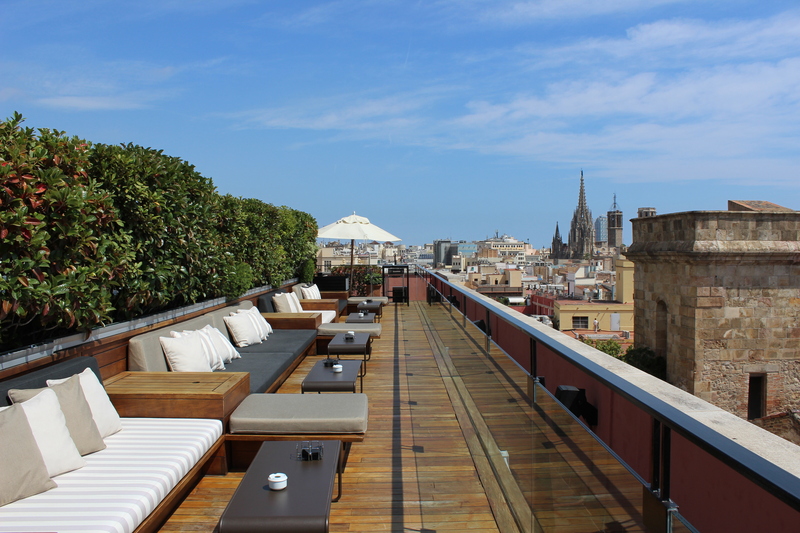 On regular days, they offer a small but fine selection of tapas, along with refreshing cocktails. 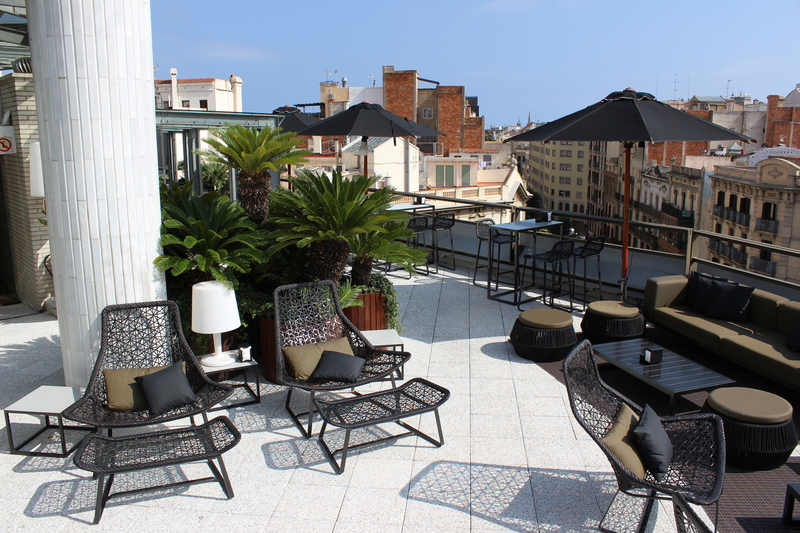 As the name suggests, the Majestic Hotel is a place of elegance, first-class service and exclusivity. 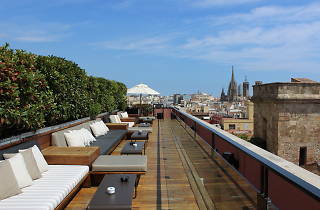 Unsurprisingly, its rootfop terrace, La Dolce Vitae, follows the same line and lives up to the expectations that come along with the hotel's reputation: with amazing views of the Sagrada Família and Montjuïc and an extensive culinary offer supervised by Michelin-star chef Nandu Jubany, an evening out on this rooftop is a guaranteed success. At €10 for a glass of the least expensive wine on the list, it's not exactly a bargain, though, and if you have to watch your budget you might want to consider La Dolce Vitae as an option for a special occasion rather than for a cloudy Tuesday afternoon. 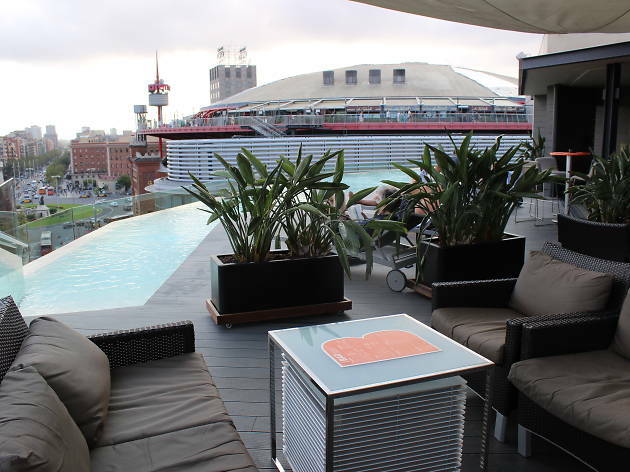 The B-Pool Bar at the top of the B-Hotel is the place to see and be seen. 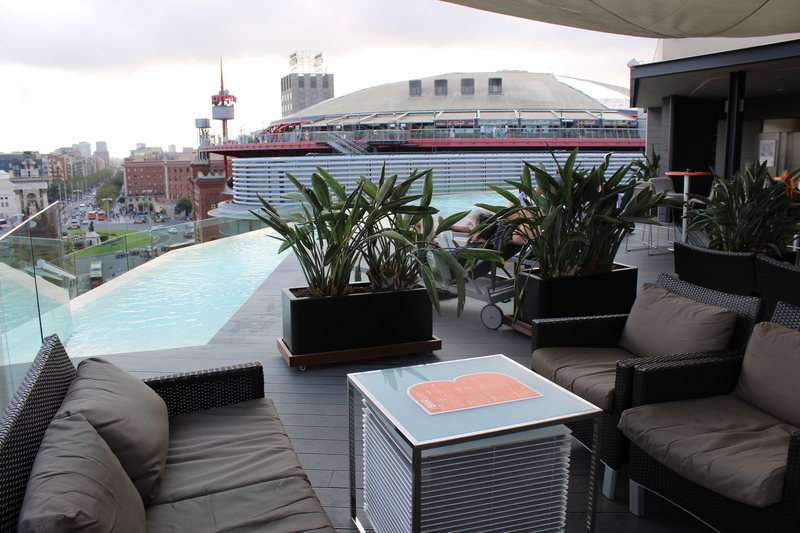 Not only does the spacious rooftop terrace provide a good view of Plaça Espanya, but you've got to agree that dining next to the too-blue-to-be-true pool and under the envious gazes from the tourists on the Arenas shopping centre's viewing platform just opposite B-Pool Bar has its own draw. And we don't blame you. 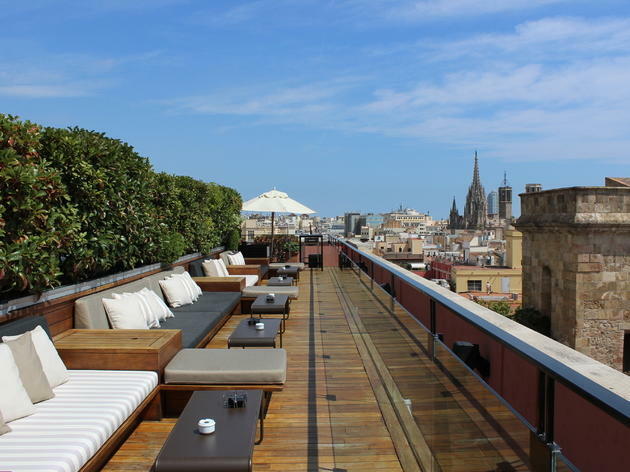 Compared to other rooftop bars, the prices for scrummy tapas and cool drinks are relatively affordable, so you can fully enjoy your evening on this elegant terrace without clear conscience... even if you can't resist ordering Ben & Jerry's for dessert.